Originally posted: August 20, 2018 . Last modified: November 29, 2018 . Our easy homemade pumpkin pie recipe uses traditional ingredients like canned pumpkin and cinnamon, but adds an extra kick of seasonal spices and sweetness! This recipe is dedicated to my Dad, who spent hours in the kitchen every Fall, creating delicious seasonal dishes. From banana and pumpkin breads to stuffings and turkeys, he was our go to chef for holiday treats. 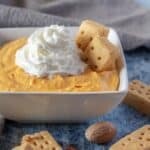 I’ve been meaning to share this recipe for quite sometime, but I wanted to wait until we got closer to pumpkin season. The recipe itself, is a modified version of his original offering. How is it modified you ask? Well, in short, I took his recipe and added a ton of Fall spices. This shouldn’t come as a surprise if you take a glance at a few of recipes. If you don’t care for a mouthful of Fall flavors, then feel free to reduce or omit some of the cinnamon, nutmeg, or pumpkin pie spice. However, I would recommend leaving in the ginger, it adds an extra zing to the pie that commercial versions seem to lack. Alright, enough exposition, how about we get down to business? First, preheat your oven to 350 degrees F. Now, that might seem strange as a lot of recipes start with different temperatures. The reason I choose that oven temp is because cooking a pumpkin pie feels similar to cooking a simple custard. You could, if you wanted, place a water bath in your oven as well; but, it’s not necessary. Additionally, I’ve always had better results cooking the pie slowly. For example, when I use a higher temperature, I always get cracks on top of the finished product. 350 degrees F. usually corrects that issue for me. Next, in a large mixing bowl with a hand mixer or using a stand mixer, combine the canned pumpkin, sugar, pumpkin pie spice, cinnamon, nutmeg, ginger, salt, vanilla, eggs, and evaporated milk. That’s right, dump everything in together. Personally, I love recipes that don’t involve a lot technical steps. Plus, it cuts down on dishes and extra time in the kitchen. Afterward, blend the mixture until it’s smooth and creamy and then, pour the batter into a prepared pie crust. It should have a custard texture after the ingredients have been properly mixed. Once you add the pie batter to the uncooked crust, go ahead and give the pie pan a little shake. Doing so, should help eliminate air bubbles that formed during the mixing process. Now, bake the homemade pumpkin pie for 60-70 minutes our until its firm and no longer jiggles. Once again, this time using oven mitts, give the pan a small shake. There should be no liquid on the top of the pie. If there’s still a slight jiggle, that’s okay because you’re going to let the dessert cool for a bit and it will firm up over time. However, if there’s still uncooked liquid, then prepare yourself for a watery pumpkin pie. Also, you can use a toothpick in the center to test whether or not the pie is done. Last, remove it form the oven and allow the pie to cool for 60 minutes before serving. You can top it with whipped cream if desired. The hardest part is waiting for it to cook, but the work is now done and you can enjoy your homemade creation. Feel free to incorporate a water bath for this pie. For all intents and purposes, it’s pretty much a custard and using a water bath will help in the cooking process. You could try using this recipe for a sweet potato pie. However, I’ve never done that, so if try it, let us know how it turns out. When it comes to baking, altitude matters. Check out this helpful High-Altitude Baking Guide from King Arthur’s website. It’s super useful for home cooks! Here’s two links to everything you need to create your own homemade pumpkin pie. Use our Homemade Pie Crust and our Homemade Whipped Cream! Next, in a large mixing bowl with a hand mixer or using a stand mixer, combine the canned pumpkin, sugar, pumpkin pie spice, cinnamon, nutmeg, ginger, salt, vanilla, eggs, and evaporated milk. Afterward, blend the mixture until it's smooth and creamy and then, pour the batter into a prepared pie crust. Now, bake the homemade pumpkin pie for 60-70 minutes our until its firm and no longer jiggles. Last, allow the pie to cool for 60 minutes before serving. Top with whipped cream if desired. The calories listed are an approximation based on the ingredients, a 1/8th serving size, and using a store bought frozen pie crust. Our pie crust calorie count is higher. Actual calories will vary. The homemade pumpkin pie can be covered with plastic wrap and stored in your fridge for up to 3-days.